The government launched the "This Free Life" campaign Monday, which encourages young people to "find their own truth" and not smoke cigarettes. "This Free Life is a campaign that proudly celebrates the lives of the lesbian, gay, bisexual, and transgender (LGBT) community," the campaign’s website states. "We wave our colors high and seek to improve LGBT people’s health by encouraging tobacco-free lifestyles." "We focus on tobacco because of the damage it is causing in our community," according to the website, which was funded by the FDA. "Think about all the progress we’ve made. From becoming powerhouses in entertainment, to standing up for our unique identities, we’ve simply come too far to set ourselves back by using tobacco. This Free Life wants to keep our momentum going by encouraging our community to live tobacco-free." The FDA said it is spending $35.7 million on the campaign that will involve print and digital ads, and "outreach at the local level to showcase tobacco-free behaviors and attitudes within the LGBT community." The campaign is being paid for by tobacco taxes. One ad shows two young lesbians meeting at a house party. "This is that moment when being tobacco-free tips the scale," a young girl narrating the ad says. "I stopped smoking cause I didn't like how it smells. I stayed tobacco-free cause this life is too good to be cut short," a girl says as the camera cuts to the two young girls holding hands as they watch a movie on a film projector. Another ad, titled "Our LGBT Story," features drag queens and gay and lesbian couples getting married. "Our sexuality, our gender, our identity were never quite understood. But we eventually found love for our own truth," a narrator says. "And now, this free life will be free from tobacco." "Our Story: A Collective Voice" starts with a lesbian, a gay man, a bisexual, and a transgender individual. "This free life, free from judgment, free from the shadows, will also be free from tobacco," the ad says. A longer version of the ad features multiple videos of teens coming out. "Born in a black-and-white world, we saw color in the mirror," the ad says. "Our sexuality, our gender, our identity were never quite understood. But we eventually found love for our own truth." "And now joy is on the horizon. Health and happiness, these are our new destinations," the narrator says. "But a factor that seems casual to some in the community can get in our way. like tobacco. Yes, that moment at the bar, the occasional cigarette, it can undermine our future." The message for the ad "Coming Out Lesbian" is "self-acceptance is just the start, we’ve come too far to harm our future with tobacco." A final ad, "Being Gendered Properly," shows a transgender teen’s "heartwarming reaction when he was gendered male for the first time." "I remember one time someone gendered me as male," he says. "I just started to embrace it. I feel at peace with my body. I am here for the long run, I want to stay." The government said it wants to push back against cigarette smoking at LGBT bars and clubs, and gay YouTube stars that openly smoke. "Research also indicates that many LGBT young adults can find a sense of community at LGBT bars and clubs, which sometimes provide environments conducive to tobacco use," the FDA said. "Additionally, when some LGBT influencers—such as YouTube personalities, community bloggers, and other nationally known figures—openly promote tobacco use, it further establishes tobacco use as a norm within the LGBT community." "We know LGBT young adults in this country are nearly twice as likely to use tobacco as other young adults," said Mitch Zeller, J.D., director of the FDA’s Center for Tobacco Products. "We want LGBT young adults to know that there is no safe amount of smoking. Even an occasional cigarette can have serious health implications and lead to addiction." The government said LGBT individuals may smoke more because of "actual and perceived social stigma" during the "‘coming out’ process." "The process of accepting one’s LGBT identity and ‘coming out’ to their friends and family leaves many LGBT young adults with a deep sense of resilience and passion to live their lives freely," the FDA said. 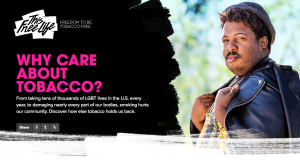 "‘This Free Life’ expresses this notion through the campaign’s tagline—‘Freedom to Be, Tobacco-Free.’"
"The campaign also uses authentic and credible messages to engage LGBT young adults by appealing to their core ideals, similar life experiences and common interests," the agency said. The campaign also warns transgender individuals that smoking can "interfere with hormone therapy." The government has engaged in similar efforts in the past. The National Institutes of Health gave nearly $5 million to a former contestant of MTV's The Real World to start "commune" dance parties for hipsters to try to get them to quit smoking. The FDA also recently launched a $36 million anti-chewing tobacco advertising campaign targeted at white male teenagers in the midwest.